Howard Webb sent this postcard image which he deduced showed the Butts - the gas lampglass reflects a sign 'The Butts'. It shows a group of eight children, mostly boys aged 8 or thereabout, and a younger girl (or it may be a boy before he was 'breeched'?). There are also two male adults in the background, aware of the photographer. The card was postmarked Brentford, December 1910 at 10.00pm. 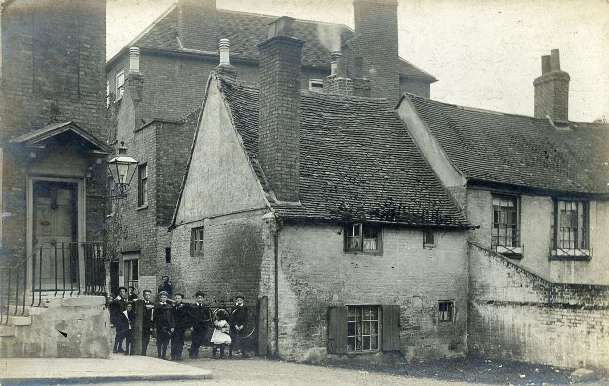 'Brentford And Chiswick As It Was' includes a similar view from 1905, describing the scene as 'cottages near the bar, lower end of The Butts', adding 'the cottages appear to have been demolished by 1940'. 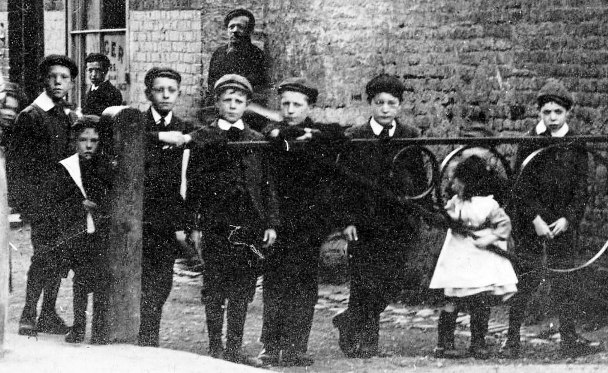 'Then and Now Brentford' p55 includes the same postcard image, noting that the gate across the alleyway was known as the 'penny, halfpenny and farthing gate' because of the three metal rings. A photo of the same area from around 2006 is included and shows the property to the left still stands. The alleyway leads to the back of the Market Place. I was so pleased to see M sad alas that I had forgotten the 4th. Did M tell you of my short lived excitement when I got the PC. It would have been nice to have (Jn? you?) too. We are full of elections shall be glad when its over br> love (?) Nan?